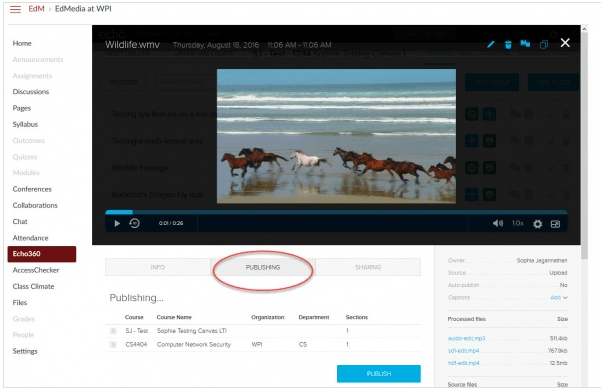 If you use Echo360 to capture your lectures either from a classroom or from your own computer then you might be familiar with your “personal library” on Echo360. This is a place in the Echo360 “cloud” where all of the videos that you own can be found. 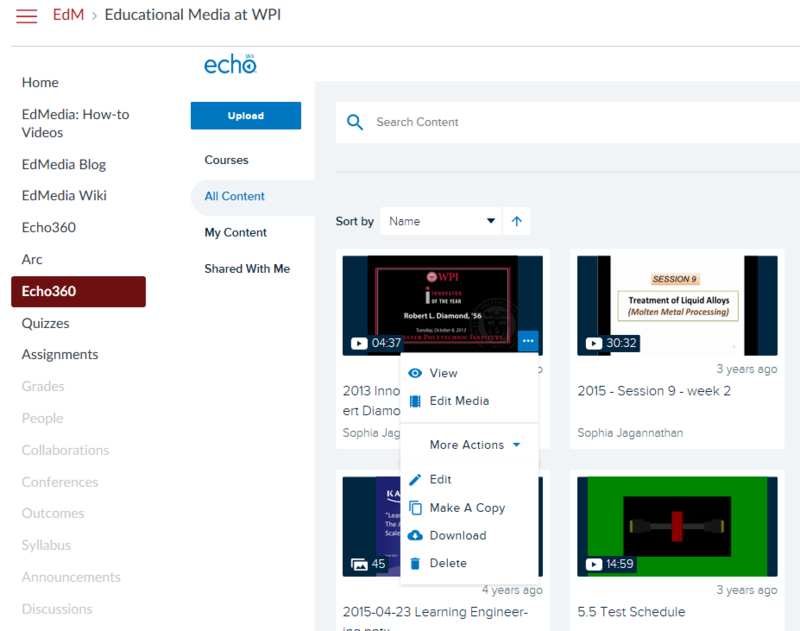 You might even go into the Echo360 personal library from time to time to pick out one of the videos you’re produced in the past and re-deploy it to a current course. You can also upload videos directly to this space. But now if you attempt to access your Echo360 library through the Canvas integration, you might be somewhat disoriented. Why? The design has changed – slightly. First, if you access Echo360 through the left side menu in your Canvas course, it looks like the below. You still see a list of your class videos. But to get to your library of videos, now you need to click on the Echo360 logo on the top left (pardon the bumpy circle please) as shown in the image above. So now you see a thumbnail for all your video content that you’ve accumulated over the years. You can filter this content according to the options on the left. You can also sort it by date and title. You’ll notice if you click the small blue box on the lower right side, with the three dots, a drop down menu appears. Here, you can do things like share the video to a class or change the name of the video. Explore. But just don’t press delete! 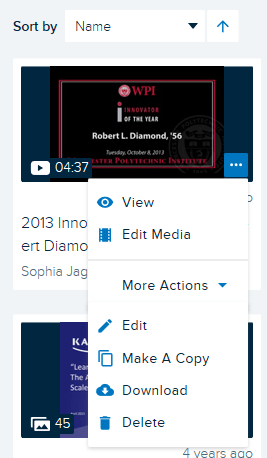 The view option is where you can publish the video to any class for which you are the registered instructor. You can also create a link that is viewable by the public by clicking on Sharing instead of Publishing. Don’t forget the upload button! 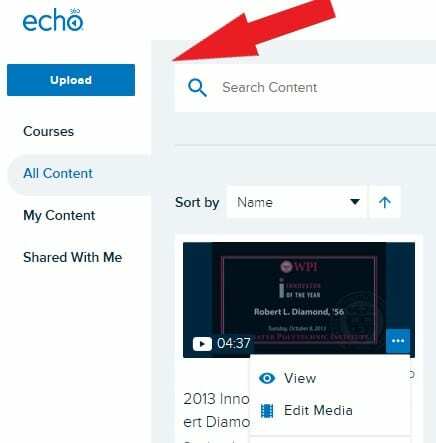 If you create a video file and want to upload it directly to the Echo360 system yourself, you can do so with the blue upload button on the top left. Then you can share that video accordingly. So, yes, change is good, change is weird, but in this case it’s mostly good and it makes sense. You can organize you content better with this new design while keeping all of the functionality of the Echo360 personal library that you’re used to. If you have any questions about Echo360 or lecture capturing in general at WPI, feel free to email me at sburke@wpi.edu. Sophie Jagannathan is the Educational Media Coordinator at Worcester Polytechnic Institute. © 2019 Educational Media at WPI. All rights reserved. Theme by Solostream.